In the past, Arab citizens have always complained about the inability of Arab League summits to produce resolutions that meet the aspirations of the people of the region, which stretches from the Atlantic to the Arabian Gulf. So how can these summits do better than the previous ones? In other words, are Arab leaders capable of doing something that they previously have not? It is a constant that politics is governed by many principles, the most important of which is establishing a balance based on interests. The post-June 1967 catastrophe of Palestine was caused by a lack of balance in Arab decisions and a lack of understanding of the political game’s rules at the time, especially as the world was changing in the wake of the Second World War. At the time, some Arab leaders were fully and unwisely following their people’s wishes without understanding the moves they were making. The other matter that should be discussed is the limits of the Arab street’s political ambitions. Is war, and nothing else, the limit? In politics, especially in the Arab region, the equation is always different. The adoption of emotional resolutions has only resulted in major crises that never ended well, and June 1967 is again a good example. I cannot say that the Arab League summits held in the past followed the principles of balance and interests, nor can I say that they did not fully satisfy the ambitions of the Arab people. The idea of satisfying the street is in itself controversial and debatable. In the world’s most powerful democracies in Europe, the authorities cannot fully meet the demands of their people. Otherwise, there would be no elections in which the ruling parties are defeated. But I can say that the street is divided and that the tune of people complaining of unmet aspirations has, relatively speaking, begun to ease given the major challenges that have plagued Arab countries, including serious economic crises and wars waged by extremist and terrorist forces. The 30th Arab League summit in Tunis was attended by nearly half of the Arab world’s leaders. There was a distinguished presence with Saudi Arabia’s King Salman. Also participating were Egyptian President Abdel Fattah El-Sisi, Kuwaiti Emir Sabah Al-Ahmad Al-Jaber Al-Sabah, King Abdullah of Jordan, and even Qatari Emir Tamim bin Hamad Al-Thani. This contributed to giving Arab citizens the sense that this summit was held in an atmosphere that puts aside all internal disputes between Arab countries, particularly given the bad circumstances in which it was held — that is following the US decision to recognize Israeli sovereignty over the occupied Golan Heights. 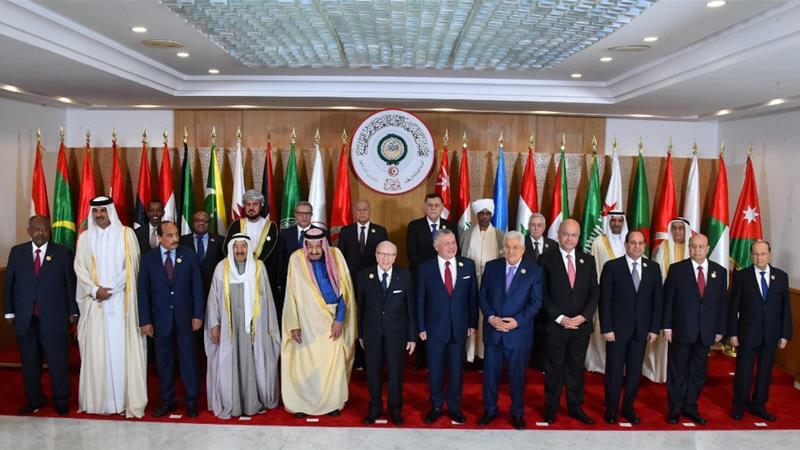 The summit responded to this crisis by announcing its categorical rejection of US President Donald Trump’s decision and its adherence to Arab values not to interfere with the sovereignty of other states or their territories as a fundamental principle. Arab leaders considered the decision null and void, and a serious breach of both the UN Charter, which stipulates that territory may not be acquired by force, and unanimously adopted Security Council resolutions, particularly 242 (1967) and 497 (1981), which unequivocally emphasized non-recognition of Israel’s annexation of the Golan Heights. The US is a permanent member of the Security Council, which means it should have respected the Charter and these resolutions. The Tunis summit highlighted the importance of achieving comprehensive and lasting peace in the Middle East as a strategic Arab option embodied in the Arab Peace Initiative, which was adopted at the Beirut summit of 2002. The Arab leaders assigned their foreign ministers to act with all political, diplomatic and legal means to continue to confront the US recognition of Israel’s sovereignty over the Golan Heights and intensify bilateral and collective communications with the international community. They planned to submit a draft resolution rejecting the move through the Arab nations’ representative to the Security Council (Kuwait), in addition to obtaining an opinion from the International Court of Justice confirming its illegality and invalidity. Here, Arabs have turned to diplomacy to address the issue. They rejected the decision and recommended following all legal methods in international forums to confront American arrogance. In fact, Arabs are involved in confrontations on several fronts, including the internal crises striking Syria, Yemen, Libya and Iraq, the permanent and chronic crisis called “the Arab-Israeli conflict,” and the threat posed by two regional powers, Iran and Turkey, which are penetrating lands in Iraq and Syria and openly interfering in the affairs of many states, including Iraq, Lebanon and Yemen. Arabs have not forgotten these crises, and the final communique issued after this week’s summit, which Tunisian President Beji Caid Essebsi described as “the summit of determination and solidarity,” stressed the centrality of the Palestinian issue for the Arab nation and the Arab identity of occupied East Jerusalem, the capital of the state of Palestine. It also highlighted the importance of achieving comprehensive and lasting peace in the Middle East as a strategic Arab option embodied in the Arab Peace Initiative, which was adopted at the Beirut summit of 2002. The participants in the Tunis summit also underscored the invalidity and illegality of the US decision to recognize Jerusalem as the capital of Israel and categorically refused to follow suit. The Arab leaders appealed to all countries of the world not to transfer their embassies to Jerusalem nor recognize it as the capital of Israel. They also called on the international community to shoulder its responsibilities regarding Israeli violations and the arbitrary measures that affect Al-Aqsa Mosque and the worshippers in it. The summit declared its rejection of Iran’s interference in the internal affairs of Arab states and condemned its aggressive attempts to destabilize security and fuel sectarian strife, including its support and arming of terrorist militias in a number of Arab countries, which is a violation of the principles of good-neighborliness, the rules of international relations, the principles of international law, and the UN Charter. The leaders present called on Iran to withdraw its militias and armed elements from all Arab countries. The participating leaders also declared their commitment to creating the means and devoting all efforts to eliminating terrorist groups, defeating them on all military, security and intellectual levels, and continuing to fight terrorism and eliminate its causes, supporters, organizers and sponsors inside and outside the Middle East and North Africa. Arabs are now fighting fierce wars from all sides, which makes holding such summits and developing effective stances and plans very urgent.